Stamped Concrete Hollis NH and natural stone hardscape features look great. Whether the features are stone patios, walkways, stairs, driveways, or retaining walls, well-set stones in the landscape around a home. With recent stamped concrete technology, you can have the look and feel of natural stone features at a fraction of the time and cost. Project days and money saved for other purposes never looked so good. 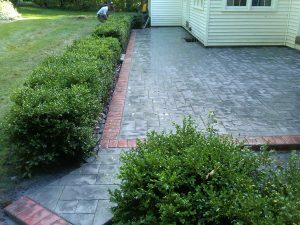 Using stamped concrete is a perfect alternative to stone and paver patios and walkways Hollis NH. It looks like wet-laid stone but costs less, is quick to install, and is completely customizable. Stamped concrete also eliminates potential safety hazards caused by loose, broken, or uneven material. KDA Construction can create beautiful, one-of-a-kind carved concrete patios, walkways, steps, or driveways in your choice of colors, textures, and sizes at a lower price than stone. Like our stamped concrete patios and walkways, our custom built concrete steps and stairways will complement any property. A simple set of garden steps or a grand entrance way, poured and colored concrete stairs are built to last. Because they look like actual wet-laid stonework, our concrete steps will add beauty as well as safety and functionality to your outdoor living spaces. They can be combined with other stamped concrete products like walkways, walls, and patios.